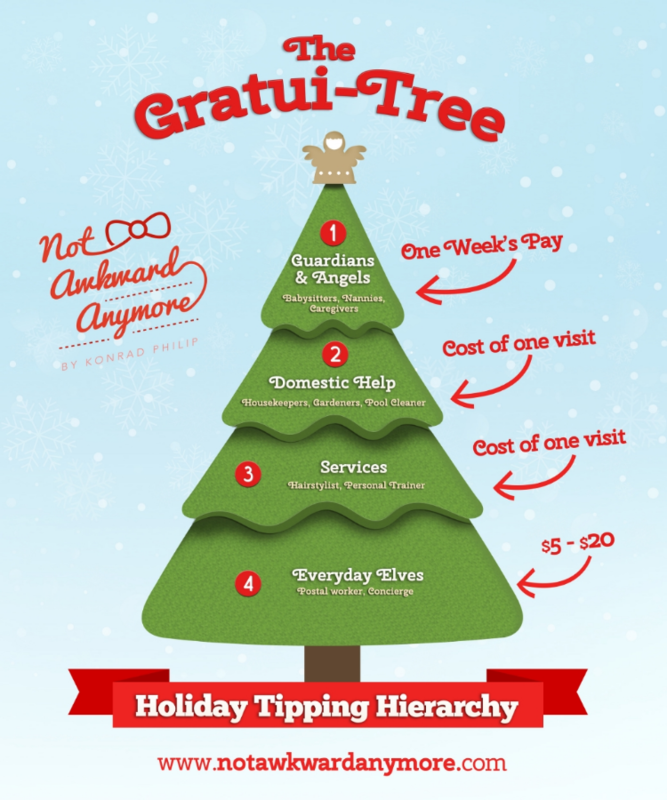 » Holiday Tipping Etiquette – Introducing the Gratui-Tree! The season has arrived for Christmas music, Christmas sweaters, Christmas parties, and, of course, Christmas gratuities. Tipping is hardly a seasonal occurrence; according to one estimate, Americans voluntarily hand over $40 billion to service personnel each year. It’s no surprise then that the holiday spirit inclines us to give even more. Those extra holiday gifts or tips, given on top of the usual gratuity, are meant to show appreciation for good service received over the passing year. We also hope they’ll influence the quality of attention we will receive in the coming one. What they are not meant to do, however, is pressure you into spending above your limit. Recognizing that there it is not always possible to give that holiday tip to everyone we would like to, I have created the Gratui-Tree, a brand new way to prioritize your gratuity spending. For those who don’t know where to start, this expert guide can help you be a nice customer, without being a naughty spender. All of our year-round service providers can be placed in 4 categories. Those who look after our family, those who look after our home, those who take care of us, and those who take care of all the rest. Let’s see whom we should take care of first when setting our tipping budget. Family First: Our family caregivers (babysitters, dog sitters, nurses) work hard to keep your loved ones safe and healthy. If you only tip one person this year, make it someone from this category. The equivalent of one night (for babysitters) or one week’s pay is appropriate. Schoolteachers also fit in this group; non-cash gifts worth up to $20 are usually accepted, but check with your school. Home Second: There’s no place like home for the holidays. Anyone who helps keep it comfortable year round deserves a token of appreciation. The equivalent of the cost of one visit is standard. Then Services: Once you have given that holiday bonus to the previous two groups, take a look inside your wallet (or perhaps your couch cushions!). Depending on what you find, you may be able to give a Christmas-sized tip to our next group. On top of the standard 20% expected at hair salons and similar services, a customary reward is the cost of one visit. Lastly, the Elves: These service providers work in the background to assure your life runs smoothly. When treated kindly they may just go the extra mile when you most need it. You may have never thought of giving your mailman or garbage collector a tip, but if you can afford to this year, you may find it pays. Most civil servants cannot receive cash or gift cards, so opt for a small gift ($5-20) instead. Although it may not be possible to give that holiday tip to everyone on your list, you can still show them all your gratitude with a thoughtful, handwritten card. If your words are sweet enough, they may just last longer than a box of chocolates!